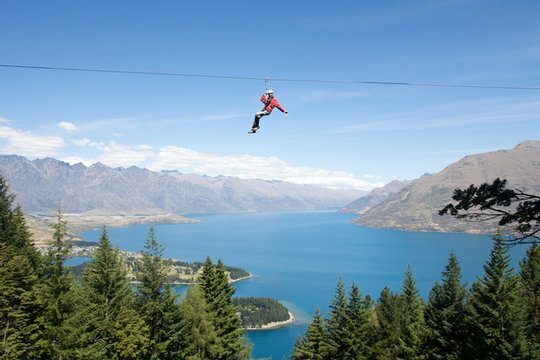 What is there to do at the Skyline Gondola in Queenstown? Nestling in the hillside above Queenstown you'll spy the Skyline Gondola. This legendary gondola ride takes you on a journey up Bob's Peak where you can enjoy a multitude of activities from exhilarating downhill mountain biking to leisurely lunches in the Stratosfare Restaurant and Bar, the Skyline has something for everyone to enjoy. My first experience of the Skyline was to try out G Force Paragliding. 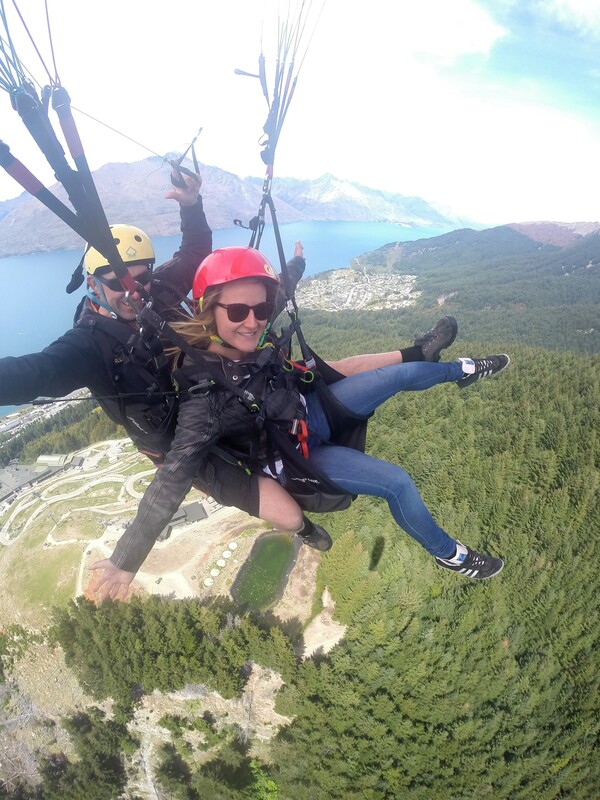 The panoramic views from the Skylines viewing platform are amazing but soaring over Queenstown whilst paragliding was a whole different story! We took lift off from the summit of the Skyline and soared higher and higher, the views of Lake Wakatipu, The Remarkables and surrounding mountains was quite spectacular. The pilot, which you fly in tandem with, tailors the flight to your desire, scenic and relaxed or exhilarating with hair raising spins (they'll even let you steer if you're lucky!). This is one great way to see Queenstown from a birds eye view. Continuing on with the adrenaline activities Skyline offers extreme Downhill Mountain Biking. We hired a bike for a day and grabbed a pass from Vertigo Bikes to experience the trails hidden in the pine trees of Ben Lomond forest. The terrain is varied with 27 different tracks so you are sure to find one that suits your riding ability, from novice green runs like Hammys, our favourite run of the day, to double blacks for the absolute nutters, I have to admit I stayed away from those ones! The gondola makes it really easy to lap to your hearts content on the specialised downhill bikes provided by Vertigo. For a more family friendly activity Luging is a must! Race your friends and family on your luge carts down the 800 metre track and then catch the chair lift to the top to do it all again! This one is fun for all. You can even target your inner Tarzan with Ziptrek whilst zip lining through the Skylines forest canopy from tree to tree, admiring the stunning views as you whiz through the woods. Our knowledgeable guides entertained us with stories, local legends and history throughout the activity. But if all that excitement isn't quite up your street you can sit back and relax in the Stratosfare restaurant where you can enjoy a delicious buffet lunch or dinner which boasts something for everyone: fresh seafood, vegetarian options, a bounty of deserts and freshly grilled meats are but a few of the many options available. All of this amazing food whilst enjoying breathtaking views of Queenstown. To get the best sunset view whilst dining this is the place to head to. And if your seeking a bit of Kiwi culture you can experience the Skyline Maori Cultural Show where you will witness a passionate performance of Maori tales with traditional haka. 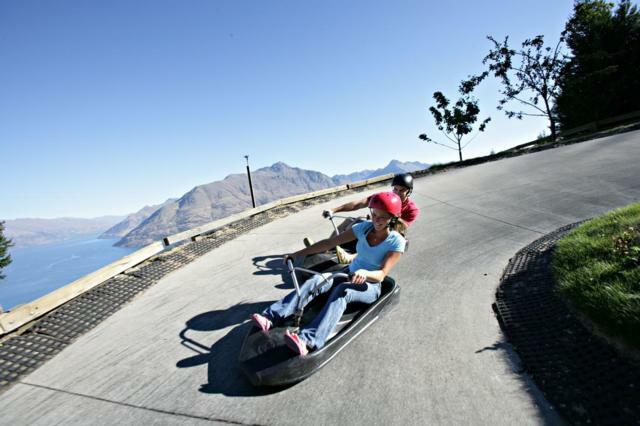 All in all the Skyline Queenstown is a hub of activities, Queenstown’s cherry on the top and definitely worth visiting!